Can Opal Rings be repaired? or any Opal Jewelry? 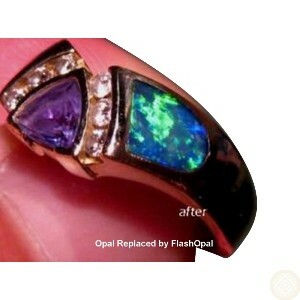 Repairing Opal rings - or any Opal jewelry ie. earrings, pendants - depends on what damage has been done, how much damage has been done and also on the style of ring. There are many factors to work out before saying Yes or No and that includes the way the Opal is set - inlaid, prong or bezel set. 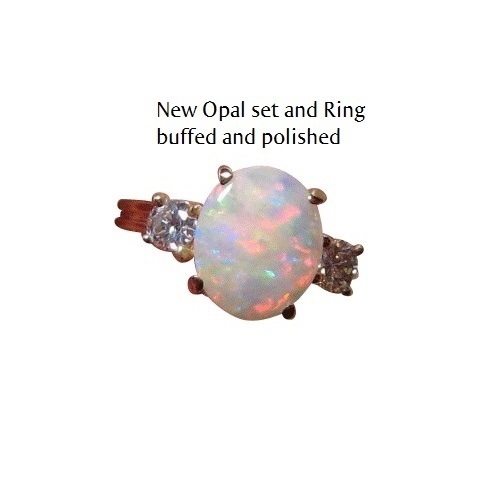 For Opal jewelry OTHER than inlaid, it will depend firstly on what the damage is. If the Opal has cracked, or split apart, then in most cases the Opal cannot be repaired but it MAY be able to be replaced. If the Opal was large enough and has split into two or more pieces, it MAY be possible to re cut and polish them to set into other jewelry. There is a practice of adding a type of resin into the crack however we do not do this. If the Opal has been chipped or a piece knocked out of it, it MAY be possible to re cut and polish the Opal. In saying this, keep in mind that any cutting and buffing will end up changing the size and possibly the shape and this depends on how big a chip it is or how much has been knocked off. A scratched Opal can be rebuffed and polished which will make a minimal difference to size but bring it back to top notch condition. If the ring has been damaged, it MAY be possible to repair the setting and reset the Opal, taking into consideration the above information. If a prong or prongs have snapped off or are worn down, care would be taken to remove the Opal without damaging it and then having the prongs rebuilt. The Opal would then be reset with the new prongs holding the Opal securely and the ring finished off with a clean and a polish to look like new. If the ring has been squashed (heaven forbid but it has happened) or the band has split, and the Opal has not been damaged, a new setting can be made either in the same style or new design custom made to fit the Opal or the band can be rebuilt to new condition. In either instance, the Opal would be carefully removed and then reset once the setting has been finished making sure the prongs are sturdy. A clean and a polish on the ring at this stage to make it look in tip top condition. The above information is for prong or bezel settings. What if you have an inlaid Opal ring or jewelry? Rings that have broken or chipped Inlaid Opal can have the damaged pieces removed and replaced with new Opal as close as possible to the original unless you would like something different. The end result will be a Good as New cleaned, buffed and polished ring you can wear with pride again. Whatever the dilemma you have with your piece of jewelry, the best scenario is to Email us providing details of the damage and any relevant information you can provide. Your inquiry will be responded to as quickly as possible and any advise for the best solution for you to consider. If your beautiful piece of jewelry ends up in our hands to repair, you can be assured all care and attention will be given with your property during the entire process from receiving to sending. The process of handling your Opal Jewelry or Colored Gemstone Jewelry. All Opal and Gemstone Repairs are done by Kent who has over 22 years experience with some of the more intricate aspects of Opal Jewelry and Gemstone Jewelry. Examples of his work at matching and replacing damaged Opals in inlay rings and other findings are below. Whether it is a cracked Opal, chipped Opal or lost Opal, or a damaged setting, the best possible scenario will be advised. All repair work includes the utmost care of your item. This may include removing the Opal or Gem from a setting, sanding, polishing and resetting the Gem to the original setting after polishing the metal work. Quotes based on photos provided by the customer can be accommodated with the cost of the repair or replacement provided via email or phone. However, the best way to give an accurate quote is to have the piece in hand. Please be assured that the very best care is taken with your jewelry and expert and honest advice given to your inquiry. Please Email your details for a prompt friendly response. Here are some examples of repair work completed. Can Opal Rings or Gemstone Rings be Re sized? Opal being the beautiful Gem it is, needs care when handling especially with setting prongs or bezels. For this reason, the Opal Rings you see online here to buy generally do not have the Opal set. If the Opal or Gemstone is set to completion, then it will only be available to those who have the particular size in the case of a ring or to those who like that particular Gold color, whether it is a ring or a pendant. If the Opal or Gemstone is NOT set, then the ring can be made in any size giving everyone an opportunity of owning a unique piece of jewelry and in their size or Gold Color. This also reduces overheads and therefore, keeps costs as low as possible. 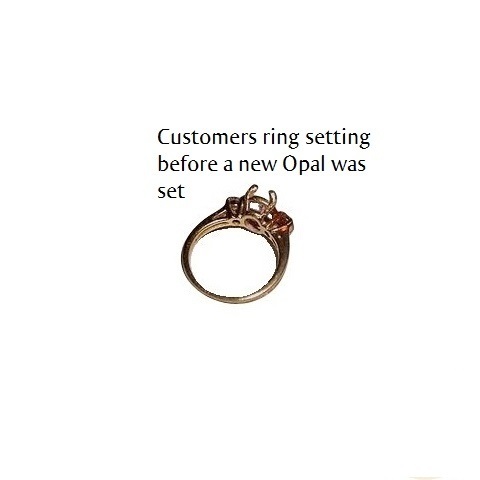 Opal requires care but so do Gold settings. Every time you change the shape of the jewelry piece, you change the amount of pressure and grip that the prongs have on the stone. You can bend the prongs back and forth to remove the Opal or Gemstone but this only weakens the Gold and makes the prong prone to breakage. If you have found a ring and the Opal or Gemstone is already set and you need the ring size up to 1/2 size larger, sanding the inside of the band will do this safely. You will, however, need to have a substantial amount of gold in the band to do this. Can Inlay Opal Rings be resized? The heat destroys the stone internally as opal is 6% water. You can use a laser welder but that is not a good idea either. One option is to sand the inside of the band if you need it larger by half a size. Otherwise a new ring can be made to match the Ring that does not fit any more. No matter what option you are faced with, rest assure your ring will have a professional look and feel when finished. If you have any questions or need advice, don't hesitate to Email your inquiry. Remember these IMPORTANT things about Caring for your Opal and Opal Jewelry. Opal is fairly durable under pressure, but it does have the same tensile strength as glass. What this means is, it will shatter relatively easy if dropped from waist height on to something hard. Always have a good grip on it when you are putting it on and off. Have a look under your feet – are you on carpet or tile? Opal is made up of a percentage of water so do not leave it in temperatures below freezing or store it in direct sunlight. If you are not going to wear it for a while, rub some body oil on the Opal before putting it away. You can smear your finger across the stone and this will be enough for a few months. If glue is one of the components of your jewelry, which is used with Bell Caps and Inlaid Opal, you should keep the following in mind. Although Opal loves water, the glue does not. The glue is actually a two part resin with thermodynamic properties. This means absolutely no hot water – it is best to keep your jewelry dry for this reason. Dip it in warm water for about 3 seconds and then clean all areas of the piece with a fine bristled tooth brush and dish detergent. It is fine to dip several times but never for longer than 3 seconds at a time. Dry the Opal and Jewelry with a tissue well, let it air out for a few minutes and when dry, rub your finger gently over the Opal. The oils on your finger are all the Opal needs to stay health and happy. Welo Opal should not be exposed to water for more than a minute or so. It will not hurt the opal but it will absorb water and diminish the color until it dries out. This can be very disturbing seeing all the color disappear however, allow it to dry and the color will return. Which is quite an unusual characteristic for a gemstone. This drying period can be from a few hours up to a few weeks depending on the amount of time it has to absorb water and what the drying conditions are like. 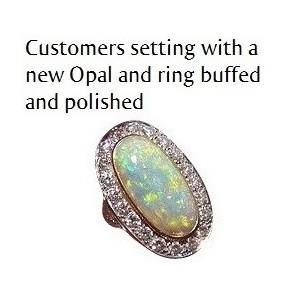 If you break a stone or need a ring resized, DO NOT take it to a jeweler unless they specialize in Opal. Bad things can happen to Opal Jewelry unless the Jeweler is an Opal expert. 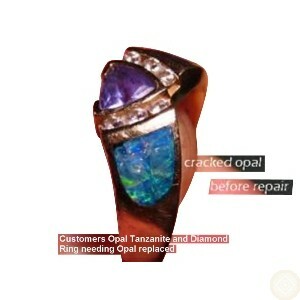 Repairing Opal is a very specialized field. Your first repair of your purchased item is done at cost the first time. Some people can wear it every day for their whole life and all is fine, and some people can wear it for a week and that’s it. A tune up of your jewelry includes re-sanding and polishing the opal, buffing and polishing the Gold or Silver work. The most important thing is, enjoy wearing your Opal Jewelry. If you have any questions, please don't hesitate to Email your inquiry.